Milwaukee, WI – Chicago’s Mark Dvorak, songstress Julie Thompson and guitarist and singer Craig Siemsen will lead the Fourth Annual Community Sing at the Coffee House, 631 N. 19th Street, Milwaukee on Saturday, February 22. The concert begins at 8:00 pm. The Milwaukee Community Sing was introduced in 2011 and based upon Lansing Michigan’s Mid-Winter Singing Festival, now in its 11th year. The songs are chosen beforehand and lyrics are projected on a screen for the audience to see. Dvorak is a national touring artist who has sixteen albums to his credit. He was part of the founding cast of The Mid-Winter Singing Festival, and leads the Thursday Folk Jam at the Old Town School of Folk Music and the Folk Club @The Grafton sessions in Chicago. Thompson is a versatile vocalist and recording artist who sings jazz, blues, folk and show tunes. She performs regularly with several ensembles in the Milwaukee area, and also works with children. Siemsen is one of the pillar’s of Milwaukee’s acoustic scene. He has performed throughout the Midwest with his wife, Patti Stevenson, and are regular performers at The Coffee House. Siemsen is an acclaimed songwriter, a powerful interpreter and a skilled instrumentalist. General admission to the Fourth Milwaukee Community Sing is $10 suggested donation. For more information on the event and the guest song leaders, phone 414-491-3980 or visit The Coffee House. This entry was posted in music on January 31, 2014 by admin. ROCKFORD IL – Just Goods Fair Trade Store welcomes Chicago’s official troubadour Mark Dvorak to its listening room for a concert of folk and original song on Friday, February 21 at 7:00 pm. Just Goods is located at 201 7th Street. The show is for all ages and a donation of $10 is suggested. Dvorak, who was named “Chicago’s Troubadour” by WFMT 98.7 fm fine arts radio last year, has sustained a career of performing, recording and teaching that has spanned more than twenty-five years. He has performed in thirty-six states and several countries abroad with only his guitar, 5-string banjo and his songs. For more information, contact Just Goods at 815 965 8903, or on the web at www.justgoods.info. Visit Mark Dvorak on the web at www.markdvorak.com. This entry was posted in live performances, Mark Dvorak, music on January 31, 2014 by admin. Dave Hoekstra has written a tribute to the legendary Pete Seeger, who died on January 27, in the Chicago Sun-Times. It is well worth a read. As mentioned in the article, Chicago singer-songwriter Mark Dvorak will be teaching “Pete Seeger & the Power of Song” beginning March 4 at the Old Town School of Folk Music. This entry was posted in Mark Dvorak, music on January 30, 2014 by admin. And thus began my journey that is now like a subway car at rush hour teeming with the likes of Harold Arlen, Jimmy Webb, John Hartford, Steve Goodman, John Prine, Warren Zevon, Townes Van Zandt, Jackson Browne, Kris Kristofferson, Todd Snider, John Gorka, Ellis Paul, Dan Navarro, Tom Waits, Ricki Lee Jones, Joni Mitchell, Shawn Colvin, Bruce Roper, Nancy Walker, Sue Demel, Deb Lader, Bruce Cockburn and so many others that cram my mind and grace my heart. Curley’s 3rd CD, There Used to be a Train, is thick with songwriter homage, both obvious and subtle. From John Lennon, Steve Goodman and Townes Van Zandt being directly referenced, and Warren Zevon’s ‘Mutineer’ being covered, to more oblique relationships like the one between ‘The Virtual Waltz’ and John Prine’s ‘Donald and Lydia’ and the one between Steve Goodman’s ‘City of New Orleans’ and Curley’s own ‘There Used To Be a Train’ – there are ghosts of songwriter influences at every turn. ‘A Townes Van Zandt Song’ received an Honorable Mention accolade in the 2013 Mid-Atlantic Songwriter Contest hosted by the Songwriters Association of Washington. Produced and arranged by John Abbey (King Size Recording, who contributes bass to the project), the instrumental and vocal support features a ‘who’s who’ of luminaries from the Folk-Americana tradition: Dan Navarro (Lowen and Navarro), Steve Dawson (Dolly Varden), Sons of The Never Wrong, 2-Bit Palomino, Don Stiernberg, Ben Lansing, Gerald Dowd, Scott Stephenson, and the brilliant Jenny Bienemann whose singular vocals grace three tracks including a duet on ‘The Virtual Waltz’. The collection of songs will stay with you long after you’ve heard them – this CD is a record meant to flow from track to track, taking you on a journey of insight, bittersweet regret, world weary advice and a range of emotional and intellectual experiences that tie the 21st century in America back to the great Folk-Americana song traditions of the past. Visit the website at www.jamescurley.net. “James Curley’s new release, “There Used To Be A Train,” is right on track, with nine well-crafted originals and a mesmerizing cover of Warren Zevon’s “Mutineer.” Song after song delivers interesting lyrics, instrumentation, and arrangements, in a superb production by John Abbey of Kingsize Recording. Curley tackles topics ranging from the decline of society in general, to laser-sharp character sketches of lonely workers and a single mom raising four kids, as well as paying homage to late greats, Townes Van Zandt and Steve Goodman. “There Used To Be A Train” is sweetened with voices and instruments by many fine artists, including Don Stiernberg, Steve Dawson, Jenny Bienemann, Gerald Dowd, Dan Navarro, and members of Sons of the Never Wrong and 2-Bit Palomino. This entry was posted in music on January 21, 2014 by admin. CHICAGO IL – On January 4, 2004 a small group of Old Town School of Folk Music students and their instructor Mark Dvorak uncased their instruments and began to sing and play in the crowded back room at The Grafton Pub, just next door to the school. It’s hard to estimate how many people have passed through the twice-monthly song session over the years. Dvorak imagines the number to be in the thousands. And only on rare occasions are songbooks or lyric sheets used. “If people are more comfortable using lyric sheets or songbooks, we have no objection. The space is tight, so there isn’t a lot room, and truth be told, it’s kind of too dark back there to read the words.,” said Dvorak. “We’ve had professional performers on tour, stop by to sing with us, and one time we had some men from the Republic of South Africa, who happened to be in the states, stop by to share some of the songs they sang while serving time during the years of apartheid. It was something powerful,” he said. Folk Club @The Grafton meets each first and third Tuesday evening at The Grafton, 4530 N. Lincoln Avenue, Chicago, right next door to the Old Town School of Folk Music. There is no cover charge, excellent food and beverages are available. Visit The Grafton online at www.thegrafton.com. 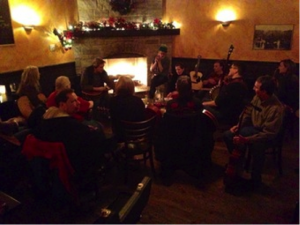 To join the Folk Club@The Grafton email list go here. Visit Mark Dvorak on the web at www.markdvorak.com. This entry was posted in live performances, Mark Dvorak, music on January 12, 2014 by admin. Downers Grove, IL– Two Way Street Coffee House welcomes Chicago singer/songwriter Amy Dixon-Kolar for a special CD release concert on Friday January 17, 2014, 8:15pm $7 Two Way Street Coffee House is located at 1047 Curtiss Ave, Downers Grove. IL 60515 More information at www.twowaystreet.org or 630-969-9720. Dancing Through the Storm is Amy Dixon-Kolar’s newest solo project. Produced by Amy and John Abbey of Kingsize Sound Lab, this CD features some of the best musicians in Chicago, including Mark Dvorak, Don Stiernberg, Sue Demel ,Deb Lader, Bill Brickey, Steve Dawson and many more. Several of the musicians who accompanied Amy on the new release will join her for the special CD release concert. Celtic, traditional, blues and folk influences are incorporated into her contemporary acoustic style. Amy’s experiences as a sign language interpreter, teacher, political activist and mother have enabled her to observe life from diverse perspectives. They imbue her lyrics and performance with honesty and wisdom. Amy’s first CD, Now It’s Time, was released in 2008 and is a celebration of finding one’s voice, of coming back to what gives the soul joy and purpose. Since its release, Now It’s Time has received national and international airplay. Rosa Sat, Amy Dixon-Kolar’s award-winning single, was honored as first runner up in Paul Stookey’s Music2Life competition in 2010. The song has received close to 300,000 views on YouTube and is being sung by professional choruses, schoolchildren and political activists around the world. This entry was posted in live performances, music on January 5, 2014 by admin. PARK FOREST IL – The Unitarian Universalist Community Church welcomes Chicago folk music masters Eddie Holstein and Mark Dvorak to the Edgar’s Place stage, 70 Sycamore Drive, on Saturday, January 11 at 8:00 pm. General admission is $15. Eddie Holstein is back on the performing circuit after recuperating from a medical procedure. Along with his brother Fred, Steve Goodman, John Prine and Bonnie Koloc, Eddie helped define the Chicago folk scene of the 1970s. His bluesy guitar style, engaging storytelling and original songs are the hallmarks of a distinguished performing career that has spanned five decades. His most well-known song, “Jazzman,” has been recorded by a number of artists including Pure Prairie League and Tom Rush. For more information phone 708 481 5339. Visit the Unitarian Universalist Community Church of Park Forest on the web at www.uuccpf.org. Visit Eddie Holstein’s page at www.fredholstein.com and visit Mark Dvorak at www.markdvorak.com. This entry was posted in books, live performances, Mark Dvorak, music on January 5, 2014 by admin.